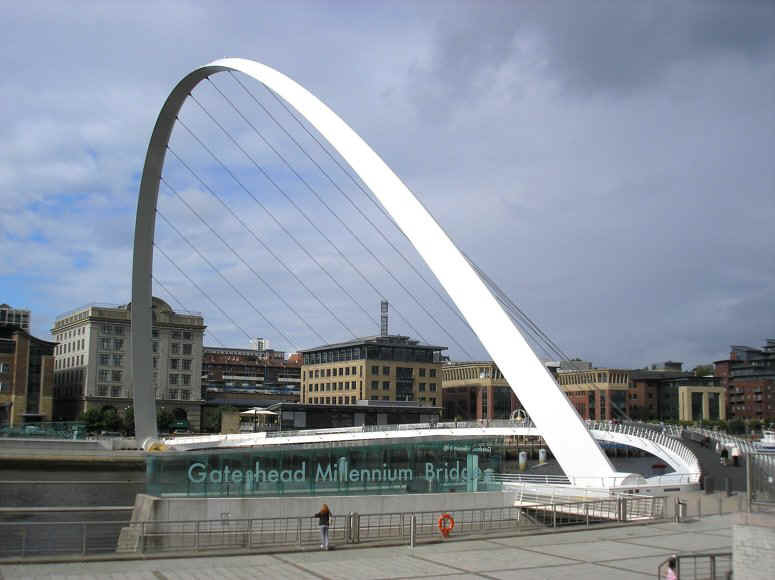 The Gateshead Millennium Bridge, designed by consulting engineers Gifford and Partners (now part of Ramboll) with architects Wilkinson Eyre, is an eye-catching, steel, opening bridge that spans 105m across the River Tyne in Newcastle, UK. When closed, small river craft can sail beneath the bridge but, for larger vessels, the cable-stayed double arched structure pivots at the abutments through an angle of 40 degrees to give a 25 metre high navigational clearance. 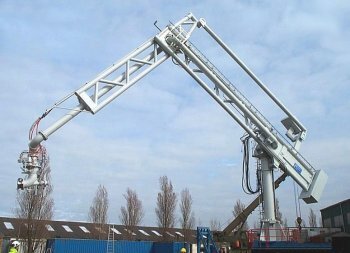 Kvaerner Markham Engineering, based in Sheffield, designed the electro-hydraulic actuation and control systems on the bridge and used LUSAS Analyst to design the support hinge assemblies which withstand the large axial and radial thrusts that are produced. At each end of the bridge, the deck and arch converge onto the support hinge assembly. This comprises a cylindrical shaft which is supported at either end by a support bearing. The bearings in turn sit in 3.67m long x 1.1m wide x 1.67m high cast steel pedestals that each weigh in the order of 14 tonnes. Each pedestal is bolted to the concrete substructure and withstands maximum design loads of approximately 4000kN vertically, 7700kN in the plane of the bolts, and 4200kN transversely. 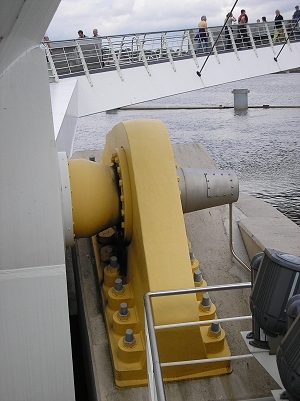 To open the bridge, a bank of hydraulic rams push against a steel paddle attached to the cylindrical shaft and push the whole structure through the required opening angle. Cylinder mountings for these rams, each weighing approximately 2 tonnes, were also designed using LUSAS. The cast steel pedestals were modelled using 8-noded solid elements. 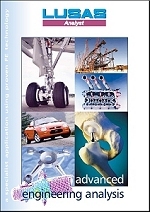 In a series of 3D solid static analysis assessments, various loadcases and support conditions were defined in order to assess the stresses in the cast steel pedestals, the contact stresses in the concrete, and to ascertain reaction forces at bolt positions for the various casting designs. Phil Snowsill, Kvaerner Markham's Senior Design Engineer on this project said, "We had fairly high loads coming onto quite compact components. This, with the additional requirement that all components had to be aesthetically designed rather than being just the simplest or most efficient shape meant that LUSAS was ideal for the job. With LUSAS, we optimised the distribution of material to give the minimum weight and cost for the applied loading and got more accurate answers than we would have done by other means." "With LUSAS, we optimised the distribution of material to give the minimum weight and cost for the applied loading and got more accurate answers than we would have done by other means."